Airtankers are used for initial attack, in which the objective is to keep a wildfire from spreading until ground forces are brought in to extinguish it. In Alberta, five different types of airtankers are used. The provincial fleet, which consists of nine groups of one or more airtankers, can be deployed to fight fires anywhere in Alberta. Rotary wings also play a key role in Alberta’s wildland firefighting efforts. Rotary wings are widely used for direct and indirect fire suppression. 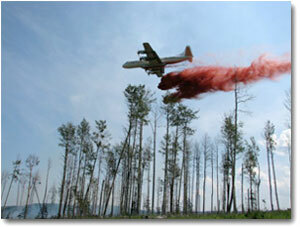 These aircraft are commonly used to transport personnel and equipment to and from forest fires. They can also drop water or foam directly on a fire perimeter to control and aid in extinguishing the fire. Airtankers and rotary wings are designed to drop foam and other fire retardants designed to reduce or inhibit combustion. Such agents are called retardants because they slow (or retard) a flame front’s rate of spread.